How many kernels does an average ear of corn have? Which four states account for over 50% of the corn grown in the United States? Does corn create humidity by releasing water vapor into the air? These are the kinds of questions that go through your mind as you ride through Minnesota. If they popped all the corn in Minnesota, the world would be covered to a depth of at least one foot. 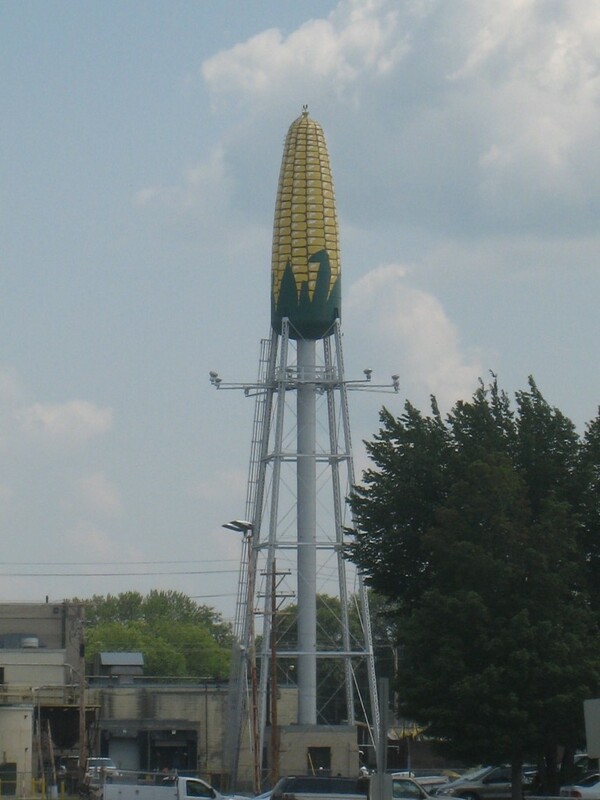 There’s so much corn in Minnesota, that they even make their water towers look like a big ear of corn. 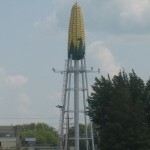 It’s high time that they move the Corn Palace from South Dakota to Minnesota. 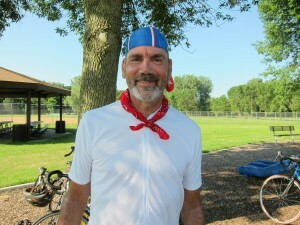 Another hot, humid day as we rode 100 miles to Rochester through endless corn fields. My old buddy and colleague, Jim Anderson, rode with me which made the ride a lot more fun. We jabbered most of the morning and caught each other up on careers and kids. By the afternoon, we were too hot to talk and spent most of our time gulping water to try to match our sweat output. Even better than having Jim along was the fact that Jim’s wife, Mary, drove a special SAG wagon stocked with ice, cold drinks, and peanut butter and jelly sandwiches. Rather than stopping every 30 miles or so — our normal rhythm — we could stop every ten to 15 miles to re-stock our water bottles, fill our bandannas up with fresh ice, and generally refresh ourselves. Mary’s very gracious and she made a hard day a whole lot easier. The tailwind helped too. People have asked for pictures of me with the ‘do rag and bandanna. I soak my ‘do rag in cold water to keep my head cool. I wrap ice cubes in the bandanna, roll it up tightly, and then tie it around my neck. On a hot day like today, that keeps me cool for about 45 minutes. That’s why Mary’s SAG wagon was so helpful — we could keep ourselves iced continuously. Since we’re in Minnesota, I’m trying to figure out how we can use corn to keep ourselves cool. Perhaps we could freeze the 800 kernels found in a typical ear of corn. Oh, and the fours states are: Minnesota, Iowa, Illinois and Nebraska. And, yes, corn releases a lot of water vapor into the air and increases the humidity. Nice front page press, TW. The front page photo of you riding, with the Rocky Mountains in the background, is a boon for tourism in the west. Must be more interesting to the locals than corn fields.